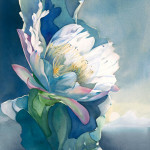 Bonine’s latest watercolor, “Out of the Blue”, was awarded first place in watercolor at the prestigious Phippen Museum’s Western Art Show held in Prescott, AZ over Memorial weekend. 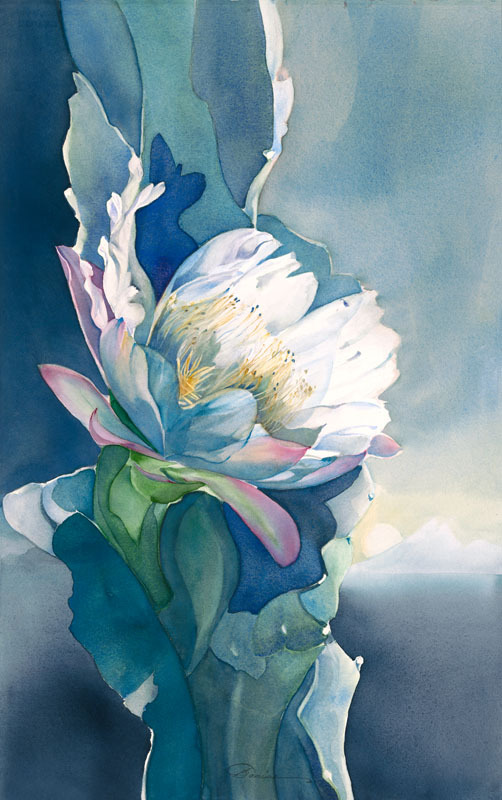 “Out of the Blue”, depicting a night blooming cirrus, is now available as a limited edition giclee on paper or canvas. When is the last time you witnessed a miracle in bloom? For details on pricing, image and edition size go to Gallery/watercolors. Order yours before they are all gone! 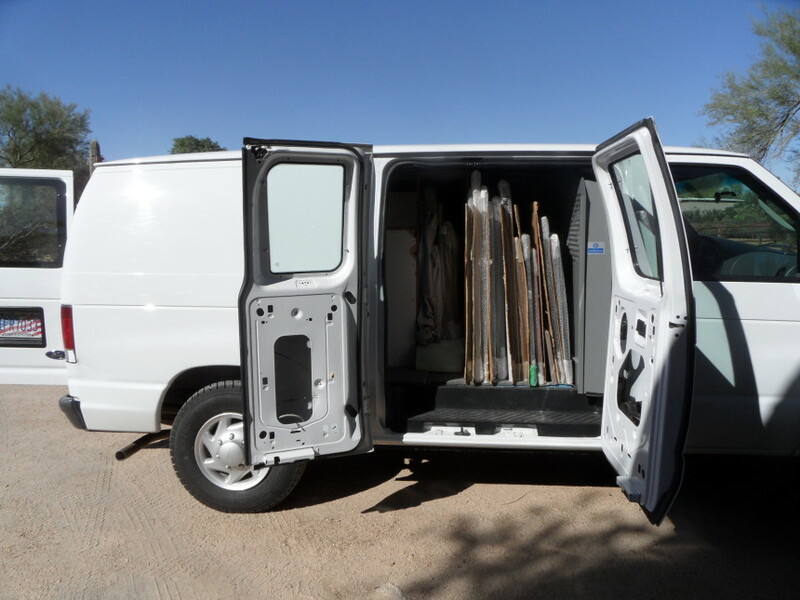 It seems like only yesterday when I said goodbye to AZ Fine Art Expo 2014. After all, I was there every day for 10 weeks – every day! The same is true for this year’s AZ FINE ART EXPO 2015 which begins Friday, January 16 and runs through the end of March. You can expect to find me there working on something new and exciting. My double booth is set up to display an array of my watercolor paintings including many that are new. Besides the originals, I am offering limited edition giclee reproductions, beautiful, luxurious pillows, greeting cards, hand painted ornaments with new garden themes and, new this year, hand painted glassware and mini watercolors. Everyone will be able to bring a piece of Bonine home. I am excited about this years showing and seeing all of my friends and lovely patrons again. So, be sure to come and see me and my new work along with a 100 other fine artists on the SW corner of Scottsdale Road and Jomax, Scottsdale AZ. Hours are 10 – 6 daily. To make sure you don’t miss me, call me ahead of time at 602 692 0099. I may be out delivering a sale! Not on my mailing list and would like to attend? Please call me at 480 585 1985 and I will extend my invitation to you, your family and friends. 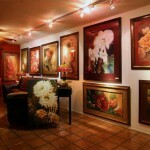 A special thank you to all who attended my studio the first weekend and helped make it a great success. You were all so kind with your wonderful complements regarding my home and studio and I am so pleased that you enjoyed the comfort and the holiday touches provided. If you didn’t get enough, as many of you did not, please feel free to return this weekend and bring your friends. 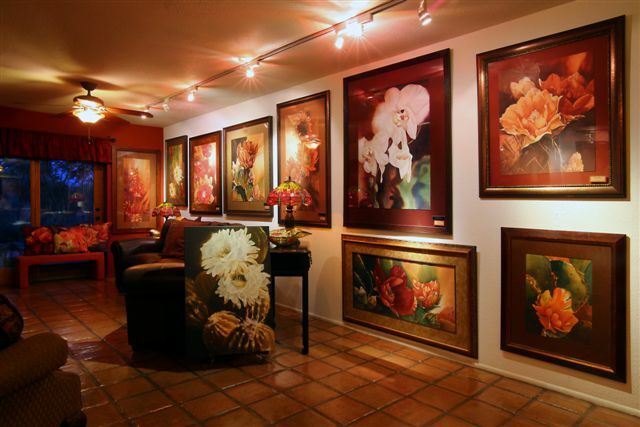 Many works of art are still on all the gallery walls and in the sculpture gardens for you to view and purchase for your home. Looking for small gifts? I still have hand painted glassware, hand painted ornaments, luxurious throw pillows and greeting cards, and for your art student friends, my open edition coffee table book is priced for this show only at buy one, receive one free! Finally fall is here, in fact the weather is about to change this weekend to perfect days and cool nights. What a perfect time to visit me at the Carefree Fine Art and Wine Festival on the streets of “downtown” Carefree. Hours are 10 = 5 daily and I will be there with lots of new works, some of your favorites, and more. 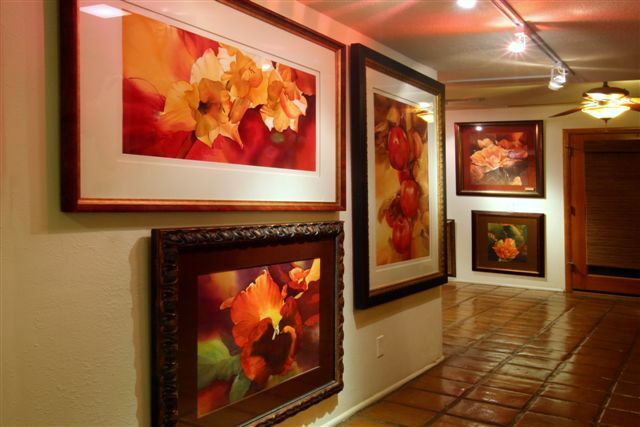 If you are not adorning your walls this fall, don’t let that stop you. 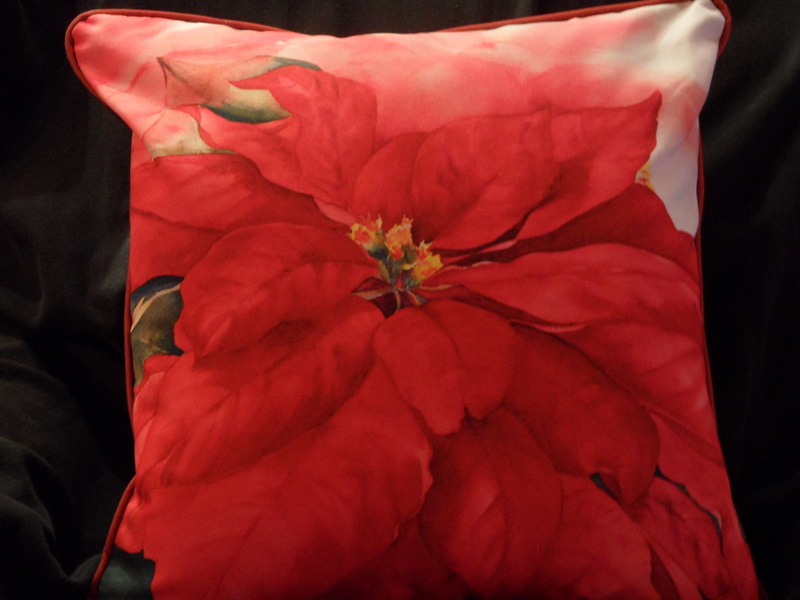 In my space you will find Bonine luxury throw pillows, a new edition of hand painted glass ornaments and, NEW THIS YEAR, a limited amount of hand painted glassware. All of these are at affordable prices for the perfect holiday gifts. Last year ornaments sold out and I expect they will do the same again as well as my new glassware. So, don’t wait until they are all gone! Next week I will have a photo of my glassware on my blog for those who can not make the shows. Look forward to seeing all of my friends again. 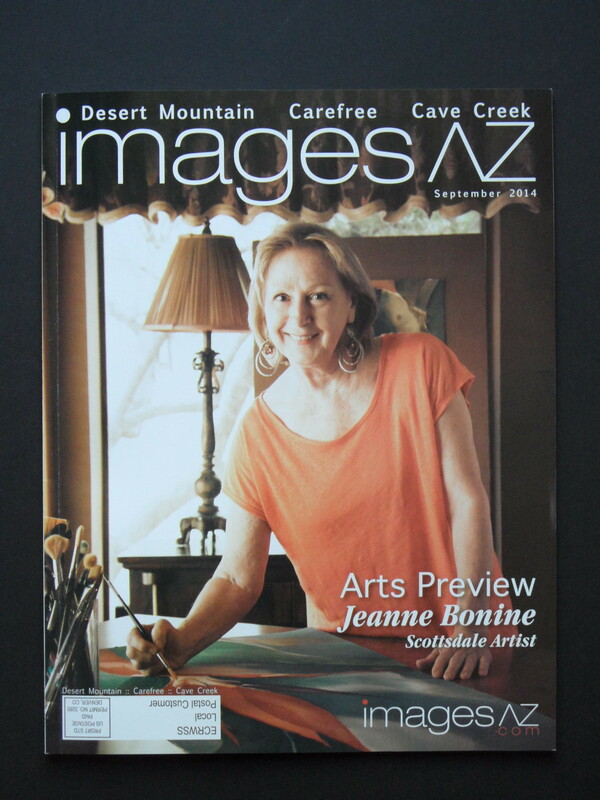 Pick up a copy of September’s images AZ Magazine featuring me on the cover! 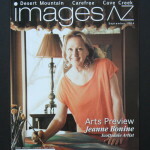 Inside article gives more insight to my new works and products that I will be exhibiting for sale this fall. With an art career that spans over 50 years, I continue to be passionate about my work approaching every new watercolor as if it will be my best. This fall my new offerings are many after a focused summer of painting new and challenging works. Can’t wait for your feedback. You can do this by visiting me at one of my fall showings beginning with the Carefree Fine Art and Wine Festival which takes place Oct 31, Nov 1 and 2 on the charming streets of downtown Carefree. Are you ready to add to your Bonine collection and bring more beauty to your life? 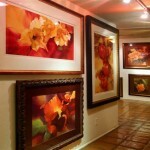 Then visit me,my new work and products at the ARIZONA FINE ART EXPO which begins THURSDAY JANUARY 16. I have designed my in-studio double space to reflect the warmth, color and serenity of my work a comfy chair is included just waiting for you. It is one of the best times to pay a visit without outdoor elements and with plenty of personal time to share with me. For your shopping pleasure, my original watercolors and giclees will be displayed along with a large framed giclee inventory stored behind my walls, so there will be plenty to choose from. All my products will be represented and for sale including my book, greeting cards, luxurious throw pillows and hand painted ornaments. SO PICK A DATE, BRING A FRIEND AND COME SEE ME SOON!